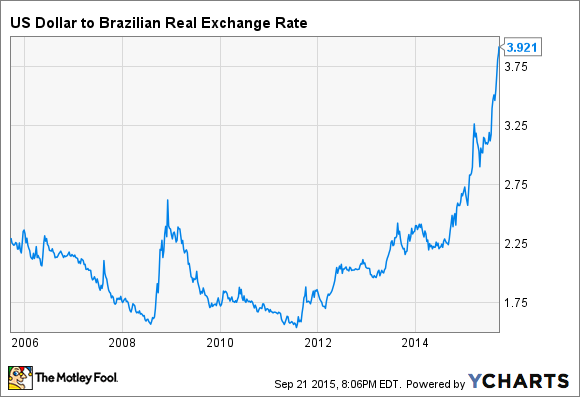 Brazil's Economy Tumbles: How Are Airlines Responding? With the Brazilian economy in tatters, American Airlines, United Continental, and Delta Air Lines have had to make some big changes. While slowing growth in China has been top of mind for many investors in the past month, economic conditions are far worse in Brazil: another key developing economy. Coming into the year, economists were expecting only modest economic growth in Brazil. The slowdown has been far worse than feared, though. Economists now expect GDP to decline 2.7% in 2015 and a further 0.8% in 2016. Meanwhile, the Brazilian real has lost more than half of its value against the dollar since early 2012, with most of that drop occurring in the past year. The combination of the weak real and the economic downturn in Brazil has caused a lot of headaches for top U.S. airlines American Airlines (NASDAQ:AAL), United Continental (NASDAQ:UAL), and Delta Air Lines (NYSE:DAL). Let's take a look at how each one is reacting to this difficult situation. American Airlines has by far the largest position in Brazil of any U.S. carrier, so the weak Brazilian economy is a particularly big problem for it. In the past year, American has cut its service to Brazil significantly. It has mostly done so by reducing frequencies and using smaller airplanes, but it also dropped its experimental route from New York to Viracopos Airport (located on the outskirts of Sao Paulo) in March, just five months after launching it. In Q2, American Airlines' capacity to Brazil was down a stunning 20% year over year, yet unit revenue still tumbled 24% in the market. As of July, American's management was planning for capacity declines to moderate in the second half of 2015 as the carrier overlaps the initial cuts made last year. However, it may announce changes to that plan when the company reports its Q3 earnings next month. American's sales manager for Brazil recently told Bloomberg that the airline is planning month to month and offering bigger and bigger promotions to fill empty seats on its planes. Given that the economic outlook for Brazil has worsened lately -- while the real has plunged nearly 30% against the dollar in the past three months -- American Airlines may need to go even further in cutting flights to Brazil to shore up its profitability there. United Airlines has also been paring its capacity to Brazil. During Q2, the company slashed its fourth quarter capacity there by 7%. Meanwhile, to drum up demand, the company began a 25% sale on economy-class "Saver" award flights to Brazil, running from late August through the end of November. United Airlines also made a bold bet on the future of the Brazilian market just a few months ago by investing $100 million for a 5% stake in No. 3 Brazilian airline Azul. The two airlines also entered a long-term strategic partnership. It will probably take a few years for United and Azul to fully exploit the benefits of their new partnership. However, even in the short term, United Airlines should benefit from some extra connecting traffic on its existing routes to Brazil. Like its two rivals, Delta Air Lines has also announced capacity cuts in Brazil lately. As of April, Delta intended to cut its capacity to Brazil by 15% in Q4. However, Delta isn't just slashing capacity across the board. Instead, it has dropped some flights from its massive Atlanta hub while adding point-to-point routes out of Orlando. Earlier in the year, Delta announced plans to begin flying from Sao Paulo to Orlando four times weekly starting in December. It also plans to replace its daily flight between Brasilia and Atlanta with a new daily flight from Brasilia to Orlando as of the beginning of December. Finally, Delta announced just this week that it wants to increase its Sao Paulo-Orlando service to daily in February. While Delta offers vastly fewer connecting flights in Orlando than in Atlanta, it is betting on higher local demand due to Orlando's big tourism market. Delta will still offer connecting flights in Orlando to key hub markets like New York, Atlanta, Detroit, and Los Angeles, though. Finally, on the Brasilia route, it will be able to use a smaller 757 aircraft that doesn't have the range to make it to Atlanta. Will any of these strategies work? The economic situation in Brazil is very fluid right now -- and lately, everything has been going in the wrong direction. Airlines will need to incorporate as much flexibility as possible into their plans, so that they can adapt to the changing market conditions. American Airlines has the most at stake due to its large presence in Brazil. Given that its initial round of capacity cuts hasn't turned things around, it will be interesting to see whether it will slash capacity in the region again in 2016. United and Delta have less to lose, but they still can't afford to leave unprofitable capacity in the market indefinitely. Investors should listen closely to what executives at all three airlines have to say about Brazil during their earnings calls next month for clues about their next moves.